You are here: Home / Topics / Build More Power / Adrian Gonzalez: Power Secret You Are Missing? In the second installment to the Hitting Backwards: 4 Common Mistakes Hitters Make video series, starring Adrian Gonzalez, we discuss why “walking away from the hands” doesn’t make sense. A-Gon is a bigger hitter (*6’2″, 225lbs) who uses human movement science correctly to generate explosive rotational power. The power secret you are missing. Contrary to popular belief, “walking away from the hands” is NOT how we load properly. It decreases turning speed by arm barring. In the 2014 Sochi Winter Olympics, if controversial gold medal winning ice skater Adelina Sotnikova could turn faster by barring an arm out, then don’t you think you’d see her do that? We’re studying the wrong hitters. Pujols. Hamilton. Griffey Jr. Paul Goldschmidt. Kevin Durant, NBA’s leading scorer, succeeds despite flawed shooting mechanics. His knees crash in, which is called Knee Valgus. Tiger Woods succeeded despite being ineffective mechanically, later in his career (4 knee surgeries, in addition to numerous Achilles and back issues). CLICK HERE to read this “Muscle Power Golf, Not!” post about this. Spend more time analyzing hitters like: Braun, Cano, David Wright, Jose Bautista, McCutchen, Hank Aaron, and Sadaharu Oh (Japan’s career home run leader). These small-sluggers have to move friction-free (or nearly) to compete. Big-sluggers with friction-free swings include: Miguel Cabrera, Adrian Gonzalez, David Ortiz, and Chris “Crush” Davis. I call this the ‘Springy X Pattern’. Imagine an ‘X’ on the front and back of the torso. When one leg of the ‘X’ shortens, then the other stretches. Golf training expert Jason Glass of Jason Glass Performance calls these Rotational Power Slings. 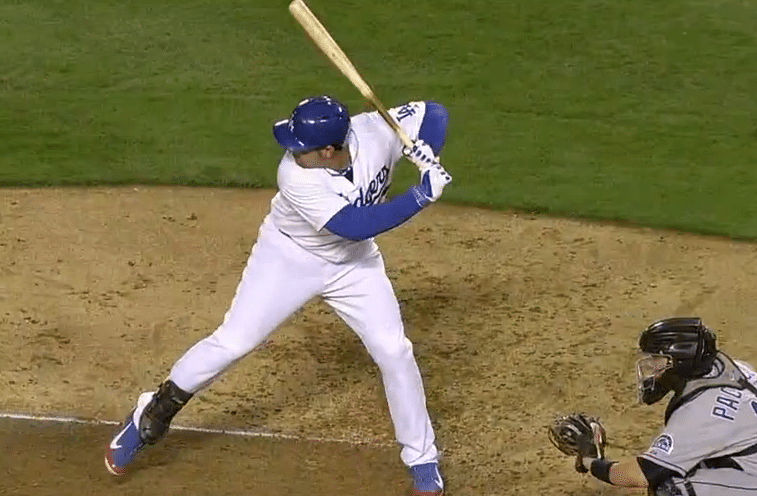 Adrian Gonzalez “spring loads” his swing using what I call the Catapult Loading System (CLS). It takes the Stability ‘X’ Pattern or Rotational Power Sling concepts and applies them to hitting. https://hittingperformancelab.com/wp-content/uploads/2014/04/adrian-gonzalez-catapult-loading-system.png 496 757 Joey Myers https://hittingperformancelab.com/wp-content/uploads/2018/05/hitting-performance-labs_c90c0362088ef1d3d528f3078f4f8ac1.png Joey Myers2014-04-18 01:52:112018-07-11 05:09:19Adrian Gonzalez: Power Secret You Are Missing?